Creative Entrepreneur is for business owners of all stripes. Whether you're a photographer, a graphic designer, a farmer, a contractor, a therapist... if you work for yourself, this workshop is for you. 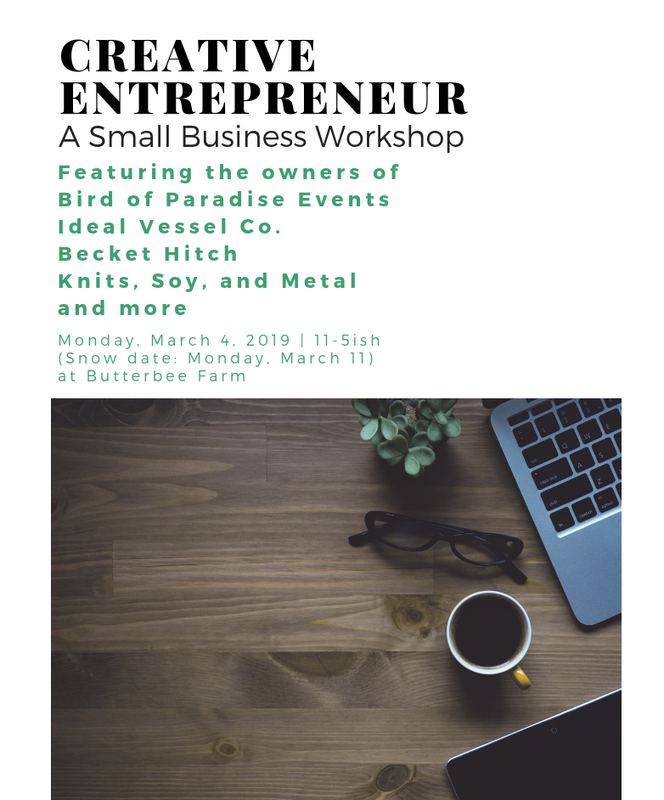 We, Ellen Frost (Local Color Flowers) and Laura Beth Resnick (Butterbee Farm), have hosted dozens of workshops together. We're thrilled to offer this packed day of information and inspiration from some of Baltimore's business leaders, and to make new connections with all of you! Please be sure you can make the workshop on Monday, March 4th as well as the snow date of Monday, March 11. We cannot offer refunds because workshop space is limited! We’ll have coffee and light snacks; please bring a water bottle and a lunch if you like. The workshop will be held in Butterbee Farm’s working barn, heated with a wood stove; please wear layers in case it gets a little toasty! You can read about last year’s Creative Entrepreneur here.